As a business or a company, you have multiple locks on your building. It may be that you haven’t checked those locks in years. Do you know how secure your locks are? Whether you got new locks a few months ago, or you haven’t checked them in a few years, it’s best to keep them maintained at least bi-annually to ensure that criminals cannot get inside while you’re not there. 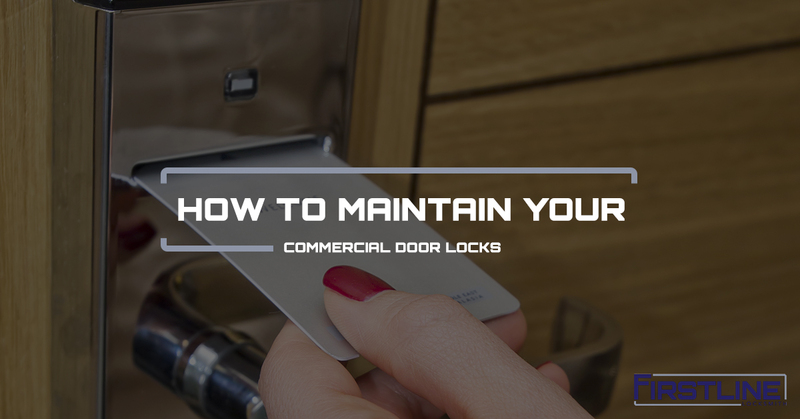 What you’ll find in this article is a basic overview of how to maintain your commercial locks. It can be a nuisance to take care of the upkeep yourself. That’s why Firstline Locksmith offers commercial locksmith services to Hamilton businesses and the rest of New Jersey. As soon as you notice a lock maintenance issue, be proactive about fixing it. For example, you may notice your key is hard to turn in the lock one morning. This is a sign that you need to lubricate your lock, or that there is a bigger issue going on. Lock cylinders are made up of small springs and pins that must move freely to operate properly. If any of these springs or locks start to get sticky or stuck altogether, you most likely have a lubrication problem. Dry or corroded locks will cause more issues for you, as well as offer a greater chance for criminals to successfully break into your building. To make sure that your lock is working smoothly, lubricate the keyway to get the pins and springs taken care of. Now that those are lubricated, your lock should go back to proper working order. Run your key in and out of the lock a few times to disperse the lube. As doors are used, the parts wear down. One of the parts that wear down are the hinges. While most don’t consider the hinges a part of the door you can maintain, the hinges can help keep your door in working order. The most common issue is the door becoming misaligned with the strike (the little metal piece between the door latch and the frame-hole receiver). When this happens, the door won’t shut entirely, allowing it to swing open. You can check the screws that hold the hinges in place to make sure they’re not loose. Make sure and tighten the screws on both the frame and the door. A door closer needs to be consistently maintained. The use of a door closer is magnificent, however. It allows you to not worry about closing doors entirely. The issues occur when the door closer doesn’t shut the door hard enough or it slams the door shut. Either situation compromises the security your commercial door provides your business. A door slammed will eventually loosen door parts that keep the door secure. A door shut too softly will eventually not latch closed, which allows for key-free entry. If you want to maintain a door closer, check the swing and latch speed of the closer. In most cases, your door will need to be custom adjusted to fit your needs. The best way to do this is to test and adjust until you get it just right. Also, consider the external climate. A windy area may need a stronger door closer than an area that doesn’t get as much wind. Rain is a factor, as well. A door that closes faster will keep more rain out during a storm. Do you have an interior door that seems to be slamming shut all the time? Adjust the door closer for a slower swing speed. In most cases, interior doors shut too slowly and they need to be sped up or the door closer needs to be replaced. Firstline Locksmith is here to serve your commercial door lock needs. Contact us today for a quote on your project.